Here’s a non-fiction review for my non-frivolous book readers! 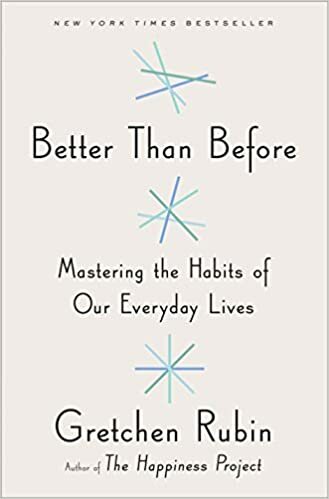 Yesterday I finished Gretchen Rubin’s latest book Better Than Before: Mastering The Habits of Our Everyday Lives. The popular author of The Happiness Project and Happier At Home once again brings readers an insightful book on her favorite topic, how to live this present life well. The Questioner – Always questioning expectations, and has to make all expectations his or her own by evaluating and deciding whether they are reasonable and useful or not. The Rebel – Basically, this person hates expectations and has a hard time with habits. Rubin, herself, is a strong Upholder, and finds it very easy to begin and maintain habits. I almost question why a person who finds habits so natural would write a book about harnessing the power of habits – can we learn anything from her struggle if there actually is no struggle for her? Then again, I suppose we can learn from the best, and she does an insane amount of research and includes anecdotes from other types of tendencies. (Side note: if you read the beginning part of this book and you classify yourself as a Rebel, good luck. You don’t want habits in your life, you enjoy making each decision you make, and having the freedom to decide yes or no to most everything you do each day. Habits are not your thing. And probably neither is this book). After doing a little self exploration, Rubin decides to tackle the seven areas in which people most commonly want to improve their habits: Healthy eating, Exercise, Finances, Rest and Relaxation, Accomplishments, Clutter, and Relationships. As is her wont, Rubin sets up a specific goal for herself in each of these areas and writes about the results. This is the part where the book gets a little less interesting to me, because I already know she is going to do a great job of creating new habits. She is going to nail this. But would I? I read this book at a great time to improve my habits, when my youngest recently turned a year old and I had the mental fortitude to improve some areas of my life that were just scraping by one sleep deprived day after another. I didn’t want to grab the whole project by the horns like Rubin did; I thought I would pick just a few areas to work on: getting up earlier and eating healthier. So far, I have failed miserably. For about a week, I did great, but then it all fell apart. I still get woken up often at night by one of the three kids, if not all, and I still can’t seem to get a meal plan together that is consistently healthy. Snacks are a whole ‘nother battle. The upside of this experiment is that I did feel exceedingly better when I did a good job of getting up early and putting healthy food on the table. I’m excited to continue my attempts at improving my habits in these areas. Overall, I liked this book. I find that Rubin’s books can bring me some ideas and get me thinking, but when I finish them, there’s a sense of emptiness for me. They lack the overall purpose of life in their theories. I don’t want to be so inwardly focused on living my life well. I want to love God and love others. Also, as a middle class American in the suburbs, her upper-middle class New York City lifestyle is very hard for me to relate to. However, if you’re interested in using the practice of habits for to empower your daily routines, I think this is a great book for you. Next post Introducing Three Book Thursday!